Now that the excitement over the BICEP2 results has abated a little it is a good time to look at just how much we can believe the BICEP2 results and the conclusions that could be drawn from them. This actually breaks down into a whole sequence of questions. Has BICEP2 really seen cosmological B-modes? Were these B-modes formed by primordial gravitational waves? If so does this confirm inflation? Does it tell us anything more specific about inflation? Does it support the multiverse? There have already been some words of caution pushed around. On the blogosphere this is most notable from Matt Strassler, Peter Coles, Neil Turoc and Ted Bunn. I endorse their point of view and I think it is fair to say that every scientist we have heard from has expressed an appropriate degree of caution but because of their natural excitement it is easy for onlookers to miss this. There is a danger that soon Planck or another experiment will publish a contradictory result that seems to rule out B-modes at the level BICEP2 has claimed and then the news headlines will be that scientists were wrong again. This would be unfair. It is important to understand that the results are understood to be preliminary but there is no need to wait for confirmation before thinking about what the implications will be on the assumption that they are confirmed. If anyone was not able to see much of the press conference on Monday due to the web overload, a video recording is available. Here is a direct link . There was also a live streamed colloquium from Stanford yesterday evening that was very watchable and informative. I don’t know if a recording will be made available. Many questions were raised at these events about the reliability of the experiment and its implications. Even the question about the multiverse has come up several times. More about that later. Has BICEP2 really seen cosmological B-modes? Everybody agrees that the BICEP2 team know their stuff and have been very professional in their approach to evaluating their results. They have performed many consistency checks on their data. In particular they have played the game of partitioning their data in two according to a variety of criteria and then examining each half independently. This is a standard technique for identifying systematic errors and every test was passed. They have expressed high confidence that their observation really shows B-mode polarisation in the cosmic microwave background but everyone is subject to the human failings of cognitative bias so this alone is not enough. Their positive cross-correlations between the BICEP1, BICEP2 and Keck are another good indication that the results are not instrument error but there are common elements of the analysis that could still be wrong. For example their was much made at the colloquium of an numerical analysis method devised by one of the team members that greatly improved there ability to extract the signal. The B-mode data is less than 20% of the strength of the E-mode signal from which it must be separated so you have to be careful that there is no systematic error (leakage) in this process. The BICEP2 team know this as well as anyone and have used data simulations to confirm that the method works. I have no reason to doubt that this is a good check but it would be wise to see if other independent teams can replicate the same B-mode pattern independently. There was also some talk about doing a correlation-check with data from the South Pole Telescope. These correlation checks are valid confirmations even though BICEP1 and SPT do not have sufficient sensitivity on their own but they are not anything like as good as another team independently producing a B-mode signal that shows the same bumps. It is worth trying to put a confidence level on how good you think the result is. I don’t do bets but I can consider a thought experiment in which Hawking is forcing me to make a bet under threat of running me down at high speed on his wheelchair. That makes it possible for me to imagine what are the breakeven odds I would accept as a way to evaluate my Bayesian estimate for the probability that BICEP2 have indeed seen cosmological B-modes. I would put this figure at about 80% for now and I consider that to be a good level of confidence at this early stage. This will change dramatically either up or down when other completely independent results either confirm or refute the BICEP2 results. There was an interesting exchange during the discussion at the end of yesterdays colloquium when someone asked “How could Planck have missed this?” It was pointed out that Planck has a very broad mission compared to BICEP2 whose only goal was to find the B-modes. Someone from Planck then stated quite pointedly that they had not yet published anything that would justify the claim that they had missed this signal. Very interesting! There is a further long list of other experiments that have the capability to look for B-modes too so soon we should know the answer to this particular question with a much better level of confidence. Were these B-modes formed by primordial gravitational waves? So if we now assume that the observations of B-modes is good we can ask about how certain we can be that these are a signature of primordial gravitational waves. At the Colloquium we heard from Uros Seljak who was the first cosmologist to realize in 1996 that B-mode CMB polarisation could be used as a signal for these gravitational waves. He was followed shortly after by Marc Kamionkowski, Arthur Kosowsky, and Albert Stebbins. See this report from Berkeley for the details of the story. If I were in a position to make nominations for the Nobel prize for the observational side of this discovery I would want to include Seljak along with people from BICEP2 but past awards indicate that the phenomenologists who take these crucial steps usually fail to be recognised at this level because they fall between the two stones marking the original theoretical insight and the final experimental discovery, too bad. I noticed that several theorists claimed that the B-modes can only be produced by gravitational waves. I think we need to be cautious about this claim. The well known additional source of B-modes is gravitational lensing from background galaxy clusters. Fortunately this effect can be accurately modelled because we can observe the galaxies and we know very well now how much dark matter is clumped around them. The power spectrum plot from BICEP2 compares their signal with the lensing background. Here is the plot with the lensing background filled in yellow to show clearly how the signal stands out above the lensing. Simply put the gravitational wave spectrum is seen a higher angular scales than the lensing so it is clearly separated. Could something other than lensing or gravitational waves produce B-modes. One thought that came to my mind was the magnetic fields can also twist the polarisation of radiation as first shown by Michael Faraday. None of the theorists have discussed this possibility so I was at first willing to accept that you need tensor modes rather than vector fields to produce the B-modes, but then I found this presentation by Levon Pogosian that seems to say otherwise. Traditionally magnetic fields have been discounted in cosmological models but in recent years some have found reason to be more open to their importance. I have no idea if this is a viable alternative source for the B-modes but until I hear a plausible direct refutation I am keeping this open in my mind. The good news is that new radio telescopes such as SKA and LOFAR should be able to detect signals from cosmic magnetic fields so I think this is a question that can be settled . Other sources of the B-modes such as galactic dust and synchrotron radiation were considered by the BICEP2 team but were only discounted at 97% confidence. This is not a high confidence level for such an important result. The significance of an observation is only valid when all possible backgrounds are accounted for so the 5 to 7 sigma claims are questionable here. We have seen many observations in particle physics and cosmology at 2 to 3 sigma fade away as new data arrived. As outsiders who could hear such results from hundreds of experiments that are taking place we should not discount the “look elsewhere effect” that this implies. The only other possibility I can think of as an alternative explanation for B-modes would be if cosmic structure had formed in dark matter before the moment of last scattering when the CMB decoupled from the visible matter. This is not the accepted view in cosmology but since the surprisingly early formation of galaxies after that time has not been explained I will not discount it. Ironically there is an improved chance of something like this happening if the primordial gravitational waves are present and that weakens the doubt that this alternative casts. Finally we should perhaps allow for the more remote possibility that something else we have not thought of can produce these B-modes. So with Hawking on my heals how would I rate my confidence that B-modes are a signature of gravitational waves. Again I think I would have to put it at about the 80% level which is pretty good confidence. This figure is harder to improve than the certainty in the BICEP2 experiment itself but future measurements of cosmic magnetic fields would make a significance difference. Assuming primordial gravitational waves have been observed, did inflation happen? Primordial gravitational waves have been described as a “smoking gun” for inflation. That would of course be the starter gun that set the universe off rather than a murder weapon, I hope. However most versions of inflation theory that had risen in popularity before these results had been announced predicted very small values of r. Very few can come close to accounting for r=0.2 or even r=0.1 if we take the lower side of the error range. There are some models that might, such as the axion monodromy inflation and even Linde’s chaotic inflation that had been all but abandoned until now. Indeed you could make the case that it would have been a better signal for inflation if primordial gravitational waves had been ruled out at this amplitude because most inflation models predict that. In a different sense it is a good thing that so many inflation models would be discounted by BICEP2 if it stands because it concentrates inflation theorists in a new direction, but the harsh fact remains that they do not yet have a fully viable theory for inflation. Scaling invariance in the CMB has already been a good result for inflation but there may be other theories that explain it (e.g. gravitational waves from other phase transitions have been cited as an alternative). The simple truth is that we know so little about the earliest origins of the universe that we cannot honestly place very high confidence on the claim that primordial gravitational waves are a sure fire signature of inflation. Nevertherless I will once again place an my confidence level at 80% in inflation if the primordial gravitational waves are well confirmed. What would it take to improve this figure? I would like to see a fully viable theory of the inflation mechanism with an uncontrived prediction (or retrodiction) of the power spectrum of gravitational waves. When this power spectrum is known to better precision (and that should now converge rapidly over the next few years) and it agrees nicely with the model , then we can be very happy with the result. So has inflation been confirmed as a Nobel worthy theory? When Sean Carroll asked us three years ago if we thought inflation happened I put my assessment at only 40% likely. This had probably increased to about 60% in the intervening years because of Planck results, but I am still open minded either way. I should make it clear that I do have a high level of confidence in the big bang theory itself but the inflation part cannot be considered settled until we have both a good theory and a solid observational confirmation. I do appreciate its strength in resolving cosmological problems and its successful prediction of CMB fluctuations but I want to see more. The BICEP2 result does not yet change my mind very much, but the good news is that there is now hope that further confirmation will make a huge difference. More detailed measurements of the B-modes have the potential to tell us in great detail how the process of inflation started, progressed and ended. Just when we thought our understanding of physics was hitting a brick wall we get this gift of an observation that promises to completely revolutionize our understanding once again. Does BICEP2 support the multiverse? This question was asked twice at the press conference (44 minutes and 53 minutes into the video recording) John Novak was quick to interject that as an experimentalist he is firmly opposed to theories that have no observational consequences. The theoriests in the room countered that by pointing out that people doubted inflation initially because they did not believe it could make testable predictions (this was all said with a lot of laughter). Linde and Guth were then consulted and they said that it is hard to develop models of inflation that do not lead to the multiverse (such as eternal inflation) There are certainly many other theorists who would have provided a very different view if they had been there. My personal view does not count for much but I have always discounted eternal inflation because it is a conclusion that is situated at the end of a long combination of speculative and unconfirmed ideas. It also does not fit with my favourite philosophical position but nobody else should care about that and anyone needs to be ready to update their philosophy if experiment requires. On the other hand I do find that the multiverse is a fitting explanation for small levels of fine-tuning and it follows naturally from what quantum gravity seems to be trying to tell us about the landscape of the vaccum (in string theory and alternatives) I just see the multiverse as the range of logically possible solutions of the physics rather than something that is actually realised. Now if the results from BICEP2 are confirmed and improved leading to a solid theory of inflation and that theory tells us in a convincing way that the multiverse must be out there, then things will be very different. Most of the levels of speculation I was concerned about would then have turned into solidly confirmed science. It is hard even then to see how a directly observable prediction could be made using the multiverse although that is not something we can completely discount and if the theory is complete and convincing enough it may even not be necessary. I am sure there will be more opinions than physicists with an opinion on this subject, but that for what it is worth is mine. This entry was posted on Thursday, March 20th, 2014 at 12:07 pm and is filed under Cosmology. You can follow any responses to this entry through the RSS 2.0 feed. Both comments and pings are currently closed. 33 Responses to How certain are the BICEP2 findings? Among the intelligent – highly intelligent – lay people I know, the sense is that fundamental science community had already used up what little was left of its slack. They are going to see this for what it is. I’m afraid the days when lofty talk and loftier aspirations substituted for actual results are over. When this got associated with the multiverse, it lost what little credibility it might have had. And your process of “calculating” your hunches is just embarrassing. Hmm, a nice writeup. I am personally at least open-minded, and inclined towards Yes, on whether the usual empirical standards for a Nobel prize for inflation have been met. And in this case, yes, I do think that the boss of BICEP John Kováč (I suppose it’s a Czech name, a word for Smith, and I won’t respect the crippling of the spelling in the U.S. LOL!) is a more natural choice for an experimental Nobel than in the case of CERN/Higgs. Now I am looking… It may be (and more likely is) a Yugoslav Slavic name of a sort, in Czechia, Kovář is more often. It is also frequent in Hungarian and even became the most frequent surname of the country – still, they spell it Kovács so he’s probably not of Hungarian ancestry. I bet on some Croatian or Slovenian roots. “One thought that came to my mind was the magnetic fields can also twist the polarisation of radiation as first shown by Michael Faraday.” – DUH! There are who knows how many ways for these B-modes to be present, from comsical/intergalactic magnetic fields (remember those Alfven filaments in the large scale structure??) to an unknown galactic process to – gasp – a possible unification of gravitation and electrodynamics in some extension of general relativity (cough cough http://link.springer.com/article/10.1023%2FB%3AIJTP.0000028858.08167.81). What speculation? Large scale filaments are an observational fact. Such things are indicative of Alfven currents and would surely imply cosmical magnetic fields. The IBEX satellite detected unmodeled magnetic fields in our own neighborhood – remember that? Here’s a reminder – http://www.dailygalaxy.com/my_weblog/2014/02/-vast-galactic-magnetic-field-extends-far-beyond-our-solar-system.html. As for my theoretical work? That’s a system of differential equations that reduces to Maxwell-Einstein GR in the limit, I invite you to solve them. So you are saying observed facts in the tangible universe are speculation, but logic chopping about the first three microseconds in hope of rescuing the multiverse is not? This is why my smart friends roll their eyes at all this stuff. They are onto the game. Otherwise your post is just great (and not a little brave) and much appreciated. Thanks for the link to the press conference – I was unable to connect to the live broadcast like many others. Thank you James. What I like about putting numbers on it is that I can demonstrate the extent to which being “quite confident” about three independent things does not necessarily lead to much confidence in all three together. This is a very important point here. I also like the fact that I can come back to this later when more information has been revealed and compare how my confidence has changed. I have gone back to Sean’s page on inflation probablility several times because he asked us to put numbers on several questions. In some cases I was surprised at the number I gave earlier and would not have realised that my opinion had shifted so much if I had not recorded those numbers. Anyway I hope I gave a realistic indication of how serious or not the quantitative value of these numbers is. Guess we don’t need the 100 tev accelerator anymore! Just keep looking at the sky long enough. How soon to put the he on a satellite or the moon and map the rest of sky? Why play with little lhcs when you can use the whole universe. Cosmology gives us very different information from what we get with a collider. Also, these results may tell us what happens at the GUT scale but fail to tell us what happens at lower energy scales. So the VLHC is still needed. However, this does show how different smaller scale experiments should not be neglected. If it was a choice between a VLHC and a 1000 experiments on the scale of BICEP2 what should be done? Costwise that is the choice we have although more realistically there are interesting experiments at intermediate cost scales. This result may make people think a little differently about future experimental strategy. One advantage of an Earth-based experiment is that the latest technology can be put in place at a late stage. With space-bound experiments you need to choose the equipment for the camera year ahead so that it can be rigorously tested. It may be possible to make some late updates but once in space it is very hard to update again (some updates for Hubble were possible using the shuttle but that was expensive and the shuttle is no longer available) With technology improving at a fast rate the Earth-bound experiments has a critical advantage over Planck. When you get to small angular measurments, whole sky surveys or wavelengths blocked by the atmosphere then observatories in space become the only option, but for BICEP2 this was not the case. As you said, caution is well-advised at this time. Thanks. Is a multiverse not already a consequence of many-world interpretation of QFT? Or is that a different multiverse? It is interesting that if one considers the universe in terms of matter/energy a conservative viewpoint is usually less of it (i.e. no multiverse until proven otherwise), but one considers the universe in terms of constraints/laws then a conservative viewpoint is fewer constraints until proven otherwise, i.e. many possible universes and physical parameter permutations. Indeed, most of them are cautious about the accuracy of the ‘data’. In addition to data, there are two more ‘interpretations’ in the story. I think that most of the readers of this site do not know the details of these two interpretations. Yet, some of the cautions are related to these interpretations too. But, this is too big issue to discuss, and I will skip it. Furthermore, the ‘inflation’ is only a ‘stage’ in this universe’s history, not the ‘structure’ of it. Thus, I will use the ‘structure’ to show that the BICEP2 data is good. Again, by using the Alpha-equation below. This formula has five important attributes. a. It matches the measured Alpha number to fourth digits (in fact, can be to any digits). The calculating accuracy of this formula can be checked by any 8th grader who knows no physics. b. It encompasses a very important physics parameter, the Weinberg angle. c. It encompasses an underlying physics framework, the Alpha-physics (based on the Weinberg angle and two numbers [64, 48]). d. With the Alpha-physics, both Cabibbo and Weinberg angles can be ‘derived’ (http://prebabel.blogspot.com/2011/10/theoretical-calculation-of-cabibbo-and.html ). Then, this equation is based only on two numbers (64, 48). e. It is a ‘structure’ constant, based only on two numbers (64, 48). Neff is a measurement about the number of neutrino species. The most pre-BICEP2 data showed it to be about 3.5, that is, there are either four species of neutrino or three with one sterile neutrino. Of course, most of scientists are waiting for more ‘data’ on this issue. But, for the Alpha-physics above, this universe is ‘structured’ with two numbers (64, 48) only. That is, there are 64-dimensions while 48 of them are scalars (matter) and 16 are tensors (energy). The 48 are divided by two, matter and anti-matter, that is 24. The 24 are further divided into 3 generations with each having 8-dimensions (2 quarks with 3 colors each + 2 leptons). Thus, Neff = 48/16 = 24/8 = 3 for the matter fields. Then, Neff = 4 if the dark energy is also included in its measurement. Now, the Alpha-physics can be the ‘evidence’ for the BICEP2 announcement, before any additional data. BICEP2 data is correct. I would like to follow up with three points. One, the gravitational wave is the consequence of the General Relativity. Now, the B-wave is a feature of the ‘structure’ of this universe. That is, both of them are not special features of the inflation which is only a ‘stage’ in the history of this universe. Thus, the media excitement on this BICEP2 data as the confirmation of inflation is just hypes from some interest groups, without any physics-merit. Two, before we know the ‘structure’ of the universe, we need ‘data’ to find out it. When the structure is known, it becomes the check sheet for checking the validity of the data, as everyone can see that the (64, 48) structure is fixed, not a prediction or a post-diction. Yet, this structure is the master key for all current open-questions (such as, dark matter, dark energy, etc., see http://tienzengong.wordpress.com/2013/09/08/natures-master-key-cuts-out-susy-the-undead/ ). 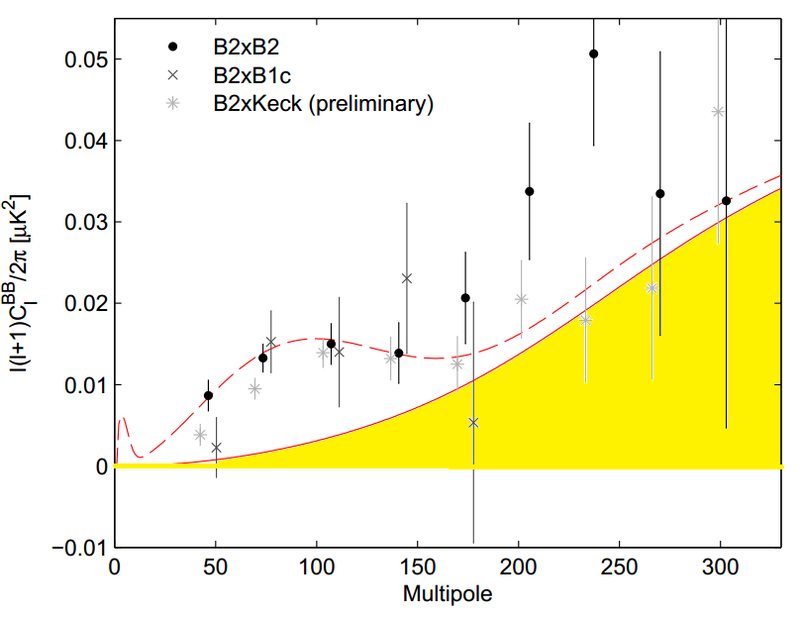 Three, the BICEP2 has probed the physics at the energy near the Planck scale, and the ‘structure’ analysis has showed that the SUSY played no role at all in BICEP2 data. That is, SUSY is not here (LHC, 8 Tev.) and is not there (BICEP2, near Planck). It will be a very confident bet for SUSY being at nowhere (see http://www.quantumdiaries.org/2014/03/21/has-anybody-seen-my-supersymmetric-particles/#comment-180198 ). Discussions on whether BICEP2 proved the Linde’s brilliant theory on origin of universes (some prefer to call it “chaos inflationary theory”, which is an oxymoron) are unnecessary because his theory has an underlying requirement — that of Multiverse, which has already been proven mathematically and multiphysically. BICEP2 is thus the first observational proof of Linde’s chaotic theory on origin of universes (inflation theory in its gazillion versions never worked so that Guth himself has recanted it in a paper more than 100 pages long — according to Linde in his latest Financial Times audio-interview at: http://www.ft.com/cms/s/2/9a306276-bf03-11e3-8683-00144feabdc0.html). It seems pathetic to see MIT now politicking to fetch Nobel for Guth. The jury is still out and one must remain cautious on all these speculative ideas! As already mentioned, the Multiverse proof relies not on BICEP, but on equations derived in the papers listed in the above. Unfortunately, he didn’t pursue this path further, so we had to wait for 70 years for my proof. Although to his credit, he did try a TOE based on electromagnetic field as generated by changing gravity fields. Those are a natural feature of forced mechanical oscillators as applied in the above Multiverse proof via generalizing secondary gravity effects for the Earth-Moon system of forced mechanical oscillators). Who will get blamed if the BiCEP results go South? If you claim detection of inflation signatures at a world wide news conference instead of getting your publications reviewed you better be able to back it up or face the consequences. I would like to see a vote here of who of the BiCEP team should be blamed if it turns out to be systematics or polarized dust from our galaxy. It is lunacy to treat science as a publicity or ego driven sport. Good way to kill careful research. I hope for their sake that the results are as they claim for they left no room for other interpretations. They went for inflation or bust. But it might have been inflation or dust! The experimenters were too overconfident with their results. They claimed a 5 sigma significance when the signal above foreground was much less and they also overstated the “smoking gun” claim that gravitational waves implies inflation. However, it is normal for experimenters (and theorists) to be confident about their own results. This is a human bias that we all have. So long as they did not make a false claim then we should not be too hard on them. As far as I know all the details were in the paper. There were no lies or hidden methods. Yes they should have shown more caution at the press conference and can be criticized for it, but they still measured a CMB polarisation signal which is a good observation. I think most people who commented on the claims showed a reasonable level of skepticism and stressed that the results needed independent confirmation. The problem of course is that the situation is simplified in press reports and the level of uncertainty is less obvious than the level of excitement over the implications. The anti-science mob can try to use this to discredit scientists. You might therefore argue that nothing should be made public until it has been peer-reviewed. I think that idea is a thing of the past. All results should be published as soon as they have gone through internal checks. Then they can be peer-reviewed openly as these results have been. It takes much longer to peer-review them in secret and sometimes only the collaborative efforts of many scientists can find the potential faults. In order to avoid the pitfalls, the informal process of open-peer-review that we have seen here needs to be made more formal so that it is clear to everyone including journalists what the status of the result is. OT: when are you going to do an update on the LHC, from the 118th LHCC meeting yesterday?